IFC is mostly known for its weird movies and Arrested Development reruns (at least according to my usual TV surfing). However due to the recent explosion of original programming on Cable channels being greater than or equal to network offerings, it was only a matter of time before niche original programming showed up on the schedule. Luckily, it's not about vampires, super-heroes, or any of that of-the-moment fanaticism. 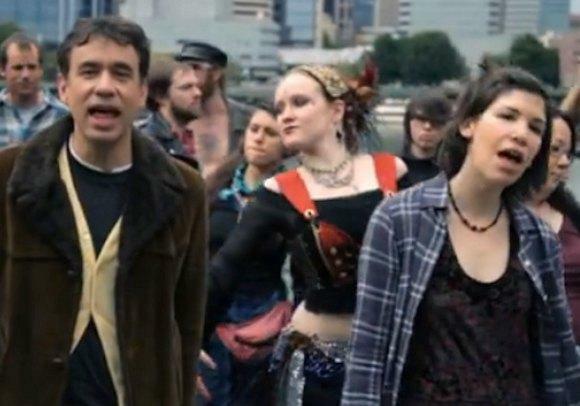 It's about Portland, the music hub of the Northwest, where the dream of the 90s is alive, according to a character played by Fred Armisen. AND HE TELLS US IN SONG, my second favorite method of communication next to "talking with food". Let's watch! The show is Portlandia, airing 10:30p on Fridays. You might recognize his co-star as Carrie Brownstein, of popular (now defunct) music-makers Sleater-Kinney, making this of vital interest to all hipsters/music fans/Portland natives. Read more on the show and see clips here.